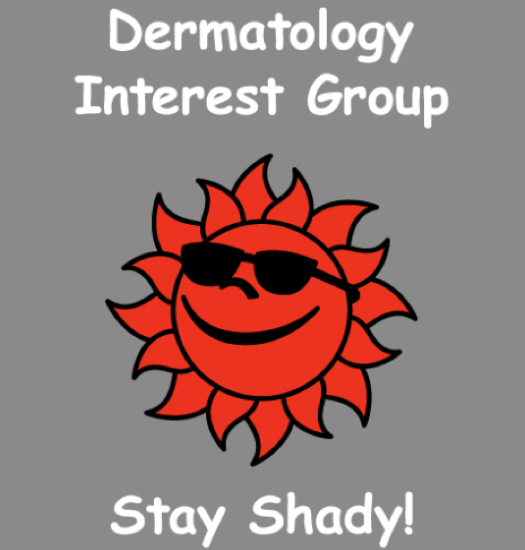 The University of Texas Medical Branch Dermatology Interest Group (UTMB DIG) is a resource for medical students interested in Dermatology as well as for dermatologists and residents. 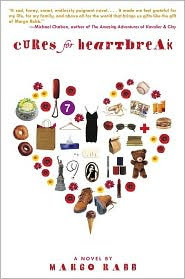 Past Editors: Keith Wagner, Tim Allen, Kristyna Gleghorn, Dung Mac, Alex Acosta, William Tausend, Sheila Jalalat, Rebecca Philips, Chelsea Altinger, Lindsey Hunter, Alison Wiesenthal, Leslie Scroggins, Mara Dacso, Ashley Group, Fadi Constantine, Emily Fridlington, Joslyn Witherspoon, Tasneem Poonawalla. 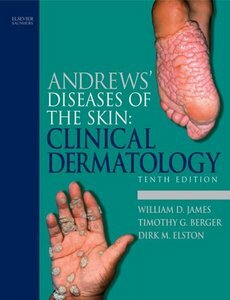 His co-authors from UTMB included Dr. Ashley Group (Associate Professor of Dermatology) and Dr. Kate Woolridge (PGY-4 Resident), as well as former UTMB Assistant Professor Dr. Berlingeri-Ramos and former UTMB dermatopathology fellow Dr. Sedrak. Congratulations to both award winners and a special thanks to the Department of Dermatology for funding these awards! According to the Wednesday, April 17, 2019 Galveston Daily News (page C3), in 2018 UTMB’s financial impact was a $2.25 billion budget, with about 3350 students and 13,100 employees (2067 in the academic enterprise). 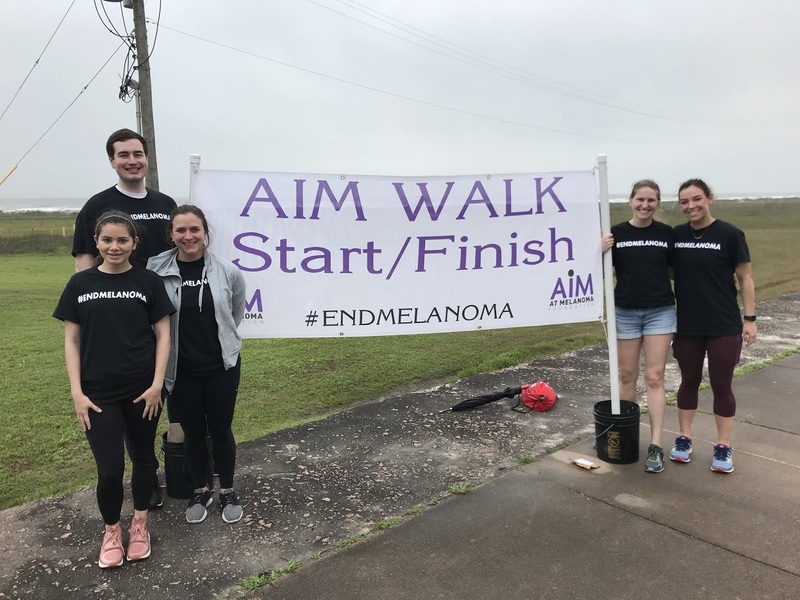 This year’s AIM at Melanoma Walk took place this past Saturday (4/13/19) on the Seawall. Caitlin Pekowski (MS3) planned and organized the event with the help of Ryan Lawrence (MS4), Caroline Crain (MS3), Michael Ryan (MS3), Corley Pruneda (MS3), and Christina Davis (MS1). DIG was able to make the event very successful this year with over $3300 raised to fight Melanoma! The walk had a Melanoma Survivor Honoree recognized for the first time, which generated a lot of interest in the walk and donations, as well as provided a deeper connection for why we hold this event. A special thank you to Caitlin Perkowski and all the other DIG members who helped make this event a success! While it is difficult to ascertain the exact nature of advertised dermatology positions from a distance, a recent mailed request for a general dermatologist will likely generate interest. The opportunity offered a “guaranteed starting salary of $450,000 with a production bonus that can add significantly to the base salary.” In addition, the employer noted that “...with a signed contract, we will pay a monthly stipend to residents while in training.” Too good to be true? The April 2019 issue of Texas Medicine in its “Pulse” column reported interesting data learned from the 2019 Merritt Hawkin’s Physician Inpatient/Outpatient Revenue Survey. Primary care physicians produce a net revenue of $2,133,273, while specialists earn $2,446,429. The average for all physicians was $2,378,727 (page 8). https://escholarship.org/uc/item/48z2d0k6#main UTMB Dermatology co-authors were Drs. Seena Monjazeb (PGY2 dermatology resident), Brandon Goodwin (Assistant Professor) and Ashley Group (Associate Professor). Congratulations to UTMB PGY4 Dr. Vlad Codrea for his recent publication, “Split earlobe repair with piercing preservation and optimal earlobe aesthetics” that was coauthored with Drs. C. Helen Malone (Baylor Dermatology, Houston) and Richard Wagner (UTMB Micrographic Surgery and Dermatologic Oncology Fellowship Director). The citation for this article is J Am Acad Dermatol. 2019 May;80(5):e115-e116. doi: 10.1016/j.jaad.2018.04.042. 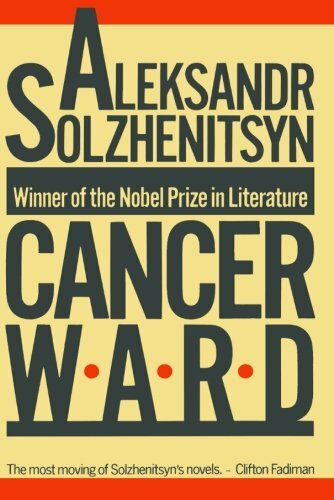 Epub 2018 Apr 30. Dr. Malone was the inaugural Mohs fellow at UTMB during the 2016-2017 academic year. 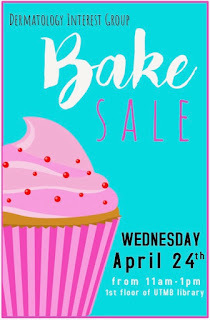 DIG will be hosting its spring bake sale on April 24th from 11am to 1pm. 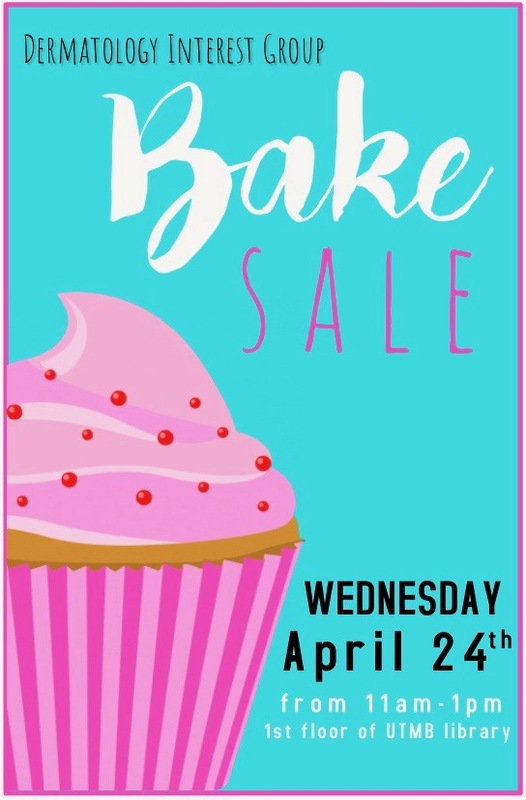 We are looking for volunteers to bring baked goods and to help set up/run the table during the event. If you're interested in volunteering, please sign up using the link below. If you have any questions, please contact Caroline Crain (cbcrain@utmb.edu). Please join UTMB dermatology faculty and residents during the annual UTMB Department of Dermatology free skin cancer screening from 10 am to noon on Saturday morning, May 4 at the Steward Road Family Clinic. Your help is appreciated! 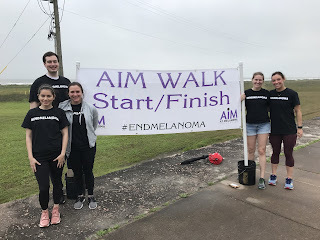 With DIG hosting the 14th Annual AIM at Melanoma 5k Walk & Fun Run on the Seawall April 13th, we are looking for volunteers to help with set up/sign in/standing at the turn around point! Any donations from DIG members of bananas, granola bars, or cases of water to pass out to participants would also be greatly appreciated even if you can't make it that Saturday. If you are interested in volunteering or donating items please sign up using the link! If you have any questions, contact Caitlin Pekowski (cnpekows@utmb.edu). The NRMP has published information about the 2019 Dermatology Match (see https://mk0nrmpcikgb8jxyd19h.kinstacdn.com/wp-content/uploads/2019/03/Advance-Data-Tables-2019_WWW.pdf ). In 2019 there were 128 participating dermatology residency programs with 447 available positions. For advanced position applicants, 488 were US Allopathic Seniors out of a total 701 applicants (69.6%). 370 US Allopathic Seniors successfully matched into 444 advanced positions (83.3%). Congratulations to all the new DIG Officers and Committee Members! Thank You 2018-2019 UTMB DIG Officers! Join UTMB Dermatology faculty and residents for the upcoming dermatology night at St. Vincent’s Clinic. Please see the calendar link below to reserve your volunteering spot. 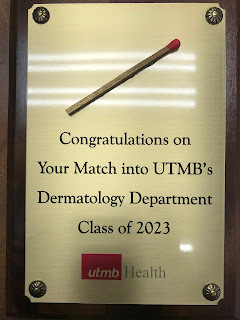 This Friday, March 29, 2019 UTMB PGY3 and 4 residents will take the American Board of Dermatology In-training Examination (ITE). This examination provides feedback to those taking the examination and their programs by providing comparisons to examinees in other dermatology residency programs. Good luck! UTMB PGY2 dermatology residents take the BASIC examination on Thursday, April 11, 2019. Congratulations to UTMB MS3 Maureen Ezekor for receiving an AAD Diversity Mentorship Award. She will work with Dr. Amy McMichael in the Department of Dermatology at Wake Forest during July 2019. Ms. Ezekor extends special thanks to UTMB faculty Drs. J. Wilson and B. Goodwin, along with PGY3 dermatology resident A. Nguyen for their support and encouragement to apply for this award. LaCour M, Allen T, Wilkerson M, et al. A case of erosive pustular dermatosis of the scalp in a pediatric patient. JAAD Case Rep. 2019;5:118-120. 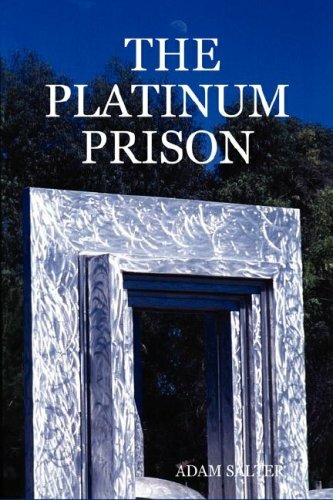 In the article above, Bernard R. Gibson, MD, was omitted from the author list. Please see https://www.jaadcasereports.org/article/S2352-5126(19)30084-0/fulltext?dgcid=raven_jbs_etoc_email for additional information. Congratulations to Mai-Anh Vu (MS3) for being selected as one of the three 2019-2020 Dermatology Interest Group Association (DIGA) Co-Presidents. DIGA is the largest national, student-run, non-profit dermatology interest organization encompassing over 100 medical schools in the US. 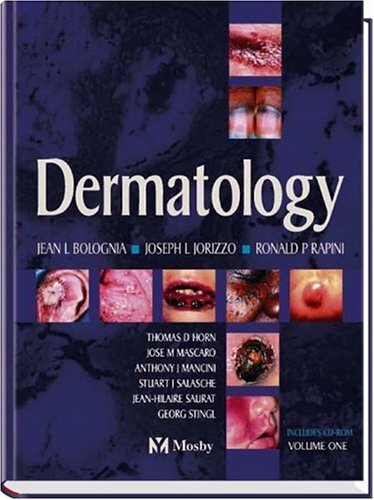 These author provide a detailed historical analysis of 12 years of dermatology match data (JAAD 2019;80:788-790). Interesting findings were that although matched applicants with PhD degrees is diminishing (11.6% to 8%), those with other graduate degrees are increasing (6.8% to 12.8%). Matched US allopathic MS4s increased from 61.7% before plateauing at 82.7% in 2012. For matching US MS4 allopathic applicants from 2007 to 2016, mean step 1 scores increased from 238 to 249, step 2 CK scores increased from 242 to 257, and AOA membership increased from 47% to 52.8%. Come join UTMB DIG for our upcoming officer elections and rising 4th year meeting on Thursday March 28th at 6:30pm in the 5th floor dermatology conference room! Several matched MS4s will be present to answer questions about ERAS, aways, and interviews. If you are interested in running for any of the following positions we ask that you come to the election meeting next Thursday March 28th at 6:30 pm. Please prepare a short statement about your previous involvement in DIG and why you would be a good fit for the position. -Runs the blog with the president and assists with day-day operations. If you don't want to be an officer or don't get a position, you can also become a committee member and help the chair with their duties throughout the year. Some residency programs are known to communicate with applicants following their rank list meeting and inform the highest ranked applicants (for example, the top 3 ranked applicants on a program that has 3 NRMP positions) to let them know that the program really wants to match with them. This is allowed under current NRMP rules as long as the program does not inquire about how it will be ranked by the applicant. This is also known as the “Ranked to Match” (RTM call). It is a relief to applicants receiving this type of notification that they are going to match into the specialty, regardless of where the applicant places the program on their match list. However, this information may convince applicants to change the order of their match list, placing the program providing the RTM higher or even number 1 on their match list because the program has indicated such strong interest (“They really want me to go there because they called and told me.”). While it is wonderful to learn that one or more programs have listed the applicant as RTM before match day, it can result in “match regret” following the match with the now matched applicant wondering if the right decision was made, because competing programs that the applicant also liked may have also listed the same applicant as RTM on their list but did not make the call. The best advice is for applicants to rank programs with the most desirable programs listed first, regardless of RTM calls that may have been received. As competitive as the dermatology residency application are, what happens when the dermatology applicant is in a couples match? When both applicants want to match into the same dermatology program, it could become much more difficult to match because most dermatology residency programs have relative few positions each year. Matching into dermatology programs in the same city or geographic area can also be difficult, even if there are multiple dermatology programs in the area because of the competitive nature of the application process. However, there may also be an advantage to couples matching when the couple wants two different specialties. Since dermatology interviews tend to be toward the end of the interview period with most dermatology interviews held in January, the applicant to a different specialty has often interviewed earlier. If the earlier applicant is competitive for that specialty and is wanted by the program director, it is not unusual for the program director to contact the dermatology program director at the same institution and request an interview for the dermatology applicant. When these types of internal contacts occur at multiple institutions it can result in an increased number of interviews for the dermatology applicant. Of course, more dermatology interviews are often correlated with increased chances of matching into a dermatology residency program. The UTMB DIG looks forward to working with you! 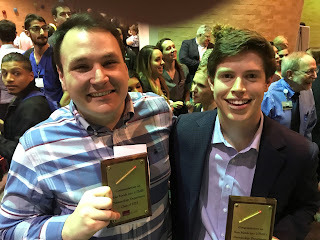 UTMB MS4 classmates Keith Wagner (left) and Drew Armenta (right) will begin dermatology residency at UTMB in July 2020. Congratulations to Dr. Mui for her recent match into a dermatology residency at Texas Tech. Dr. Mui graduated from UTMB SOM in 2016 and following completion of her PGY1 Preliminary Medicine year in California, took a clinical dermatology fellowship position with Dr. Stephen Tyring (Houston Skin Associates) for the past two years. Another Successful Year for MS4 UTMB Dermatology Applicants! Thank you UTMB dermatology residents and faculty for your support, outstanding education, and professional growth opportunities! 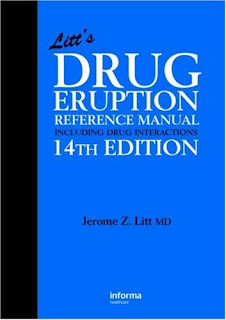 Litt's Drug Eruption Reference Manual Including Drug Interactions (14th Ed) by Jerome Litt, M.D. Old Red has played a vital role in the history of the University of Texas Medical Branch at Galveston since the school began serving the health of Texas more than a century ago. 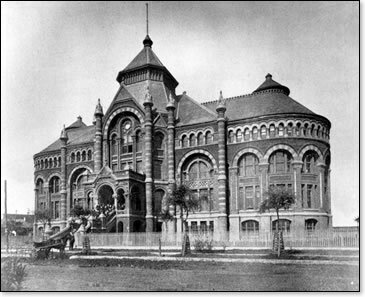 Officially known as the Ashbel Smith Building, but affectionately called “Old Red” by UTMB students, faculty, staff and alumni, the structure today serves as a grand reminder of the university’s history while supporting its modern mission of education, patient care and research.